Eight days ago, our baby girl became a big girl. Relatives and friends from near and far came to help us celebrate. It has been wonderful to have so much help, love, and support from friends and family. Our sweet little two year-old has had to make some big adjustments now that Jonas is around, but she’s doing very well. You can read more about Eliana’s progress at her monthly update page. The following video has just a few of the fun moments from the past couple of weeks. 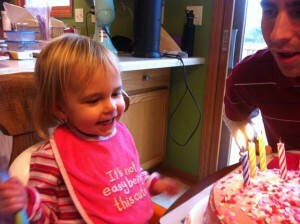 It includes several instances of Eliana opening presents, and three occasions where we lit candles and sang to her. There are so many things in the video that make me smile. One of my favorite moments is at about 4:22, when Eliana spontaneously hugs Uncle Randy. This entry was written by ben, posted on December 15, 2012 at 8:35 pm, filed under Eliana, Family Gatherings. Bookmark the permalink. Follow any comments here with the RSS feed for this post. Comments are closed, but you can leave a trackback: Trackback URL.